Japanese bee's dividing was made and this page was made wanting to apply the record of the growth after the first crowd had been captured on April 25, 2010. Because the second crowd that had captured it on May 11 afterwards was gotten, here is recorded. 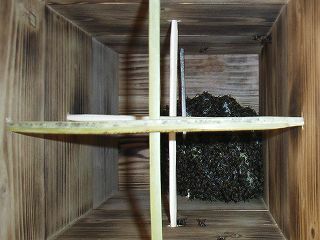 This photograph was a japanese bee group captured and taken into the breeding box. The bee was thrown into the bee house prepared as a waiting box (waiting tub). The insect repellent side cloth and gloves of the net were worn at this time. First of all, the box top was quietly expanded by both hands with the cardboard box made upper and lower and inverse by both hands, and it brought it on the bee house. It was suddenly dropping of shake bee's ball to the bee house as for the cardboard box. 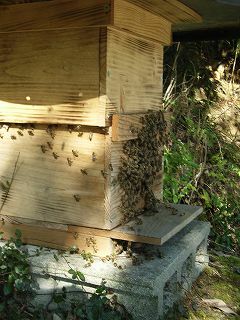 The lid was done to the bee house at once beating the cardboard box rough. 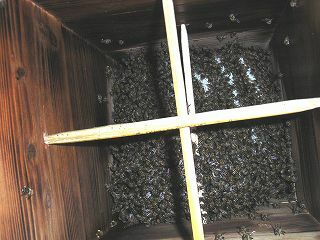 Everything cannot be put in the box at a time, and bees of a considerable number have fallen in front of the bee house as shown in this photograph. The bee entered the bee house everything after this. Bee's ball is taken and the photograph in Japanese bee's nest of the fourth day. It strikes close to the bee house carelessly when the lid above is opened, and one nest board has dropped. The size of this nest was 90mmX65mm. About 1 of six corner types and the actual measurement value of the distance with the opposite side were 4.5-4.9mm. 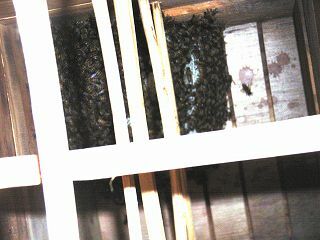 It took a picture with the digital camera in the bee house because the bee house had been remodeled to the slide bottom board. The size of the nest seems about 15cm in the diameter. The size in this bee house is about 240mm corner. The height of one step is about 180mm. They are four steps. Board thickness is about 12mm. The size of the nest seems about 25cm in the diameter. The nest is built to the center of the second step on the bee house of about 18cm in the height of one step. It is a nest of the bee to which a slow person was captured on May 11. 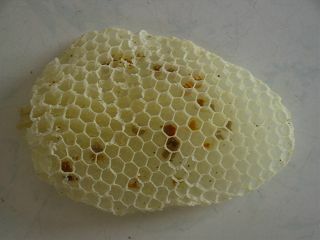 The size of the nest after Dividing of bee 40 days later seems ..about 18cm.. to be growing the diameter. Because the number of bees was little, this crowd's speed of growth seems to be about the 20th originally slower than that of the first crowd.